Well, I didn’t get a chance to post the cards before Christmas. This year, it just seemed like it was Thanksgiving and then two weeks later it was Christmas. I did get everything done though and we had a great time with family. OK, so here we go. I’m not going to list the “ingredients” of each card but feel free to e-mail me for the info if you really need it…hee hee hee. With the exception of the "Noel" on Josh's card, all card stock, stamps, embellishments and tools are @Stampin' Up. I love the simplicity of the card even though there were multiple steps involved, embossing twice and then adding crystal effects. The new wreath set and matching die by Stampin’ Up is one of my favorites. I love the "non-traditional" colors and I think the little star adds just enough bling. I love the sequins and since Amanda loves sparkle, I just had to include them. We had a great Christmas. Spending time with family is one of the best things in the world. I hope you all had a great Christmas too. Here’s to 2015! Josh turned 20 last week. Wait, what? Seriously, how can that be? Yes, that's right. He is no longer a teenager. Where has the time gone? Josh still needs to show me how to use the paddle shifters on my car before he goes back to college...hee hee hee. As I mentioned in Thursdays post, my sister and I painted on Thursday night. It’s called Paint Nite St. Louis and there are various sites across the area where the events are held. We chose Morgan Street Brewery because a) liked the painting and b) they have beer….hee hee hee. We arrived early so that we could eat dinner before we began painting. The weather was perfect so were able to eat outside. My mom and dad were married 57 years ago today! That in itself is amazing but what is also amazing is that I realized that Bill and I have been married almost half as long as my mom and dad! Time flies, that’s for sure. 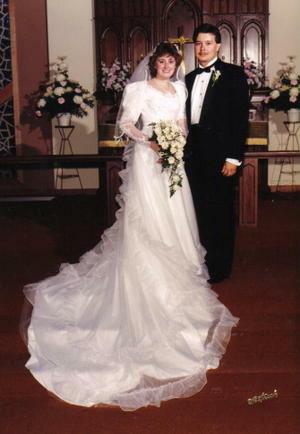 Happy Annivesary, Mom & Dad. Love you!